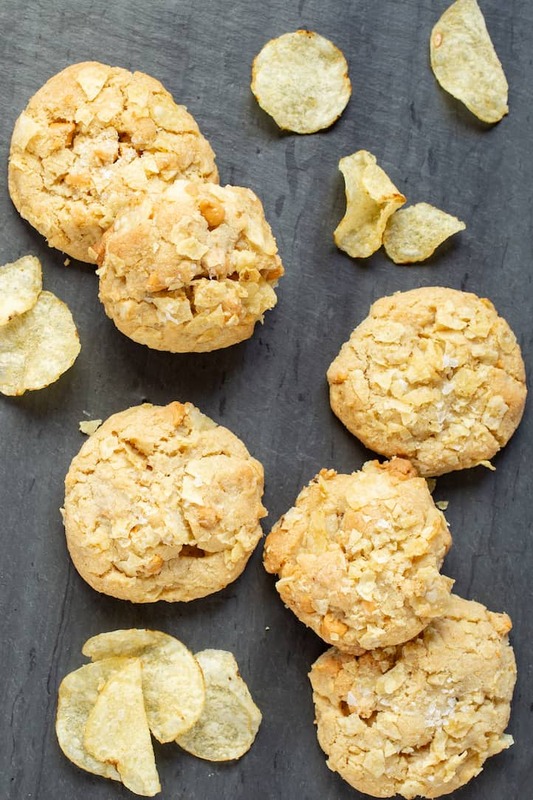 Butterscotch Potato Chip Balls from The Vintage Baker | Good. Food. Stories. It’s no secret that I’m charmed by all things midcentury vintage. I could spend hours poring through antique shops and junk barns all over the country, seeking out Pyrex and Fire King dishes, cast iron skillets, and Herman Miller school chairs. So it’s no surprise that I’m head over heels for The Vintage Baker, a new cookbook by my new friend Jessie Sheehan. Sheehan, a longtime collector of vintage recipe booklets, parlayed her amateur sleuthing into a profession as she baked and tested her way through her collection. Her vast resources of booklets offered up surprisingly tasty tidbits as they hawked their promotional recipes through the decades, giving her room to experiment with the foundation of cakes, pies, and confections within their pages. And so The Vintage Baker melds the old and the new in its collection of recipes, bringing a post-modern sensibility to desserts that already have withstood the test of time. 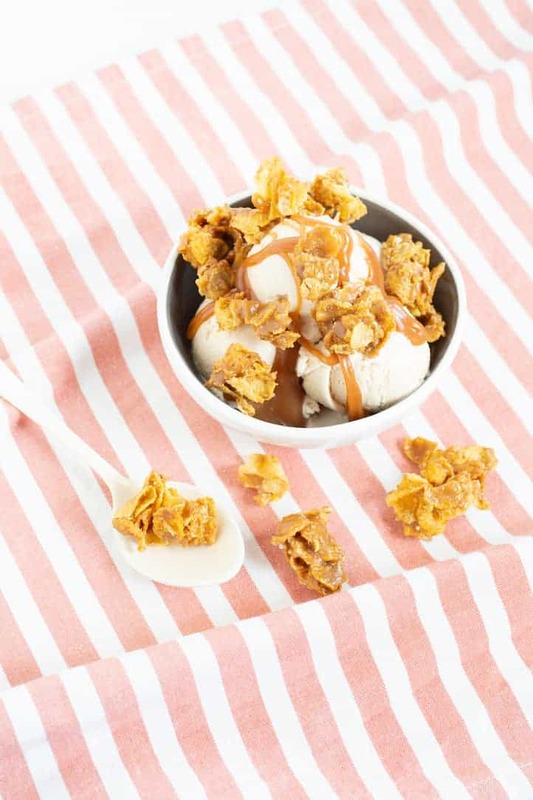 Some of the book’s treats combine recipes from different booklets of different eras: the Salty Caramel Crunch Sundaes with Caramelized Cornflakes pairs a 1928 recipe for caramel ice cream from the Frigidaire Recipes booklet with a caramelized cornflake topping from 1951’s Refrigerator Desserts (and homemade salted caramel sauce for good measure). Adding salt to caramel (a flavor that was “all the rage in the first half of the twentieth century”) is only one of the ways that Sheehan judiciously brings in 21st-century elements to recipes, as in the Cacio e Pepe Popovers, where Sheehan adds savory cheese and black pepper to a simple 1933 recipe, or the addition of fresh herbs to fruit in the Strawberry Basil Turnovers. 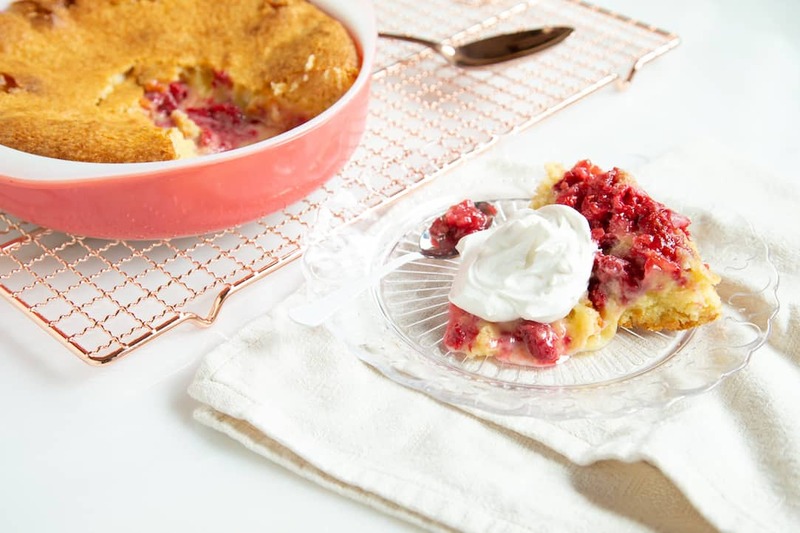 In other cases, she leans into the whimsy and wonder of recipes that showcase the ingredients promoted by the branded booklets—like the Raspberry-Marshmallow Upside-Down Cake, which turns its wacky mash-up of flavors into a surprisingly successful caramelized, custardy dream once baked. The book itself is an adorable homage to vintage design, complete with a sewn-in booklet where readers will find a number of the original recipes that Sheehan adapted for the imaginative desserts that make up the cookbook. Tips and quotes at the start of each chapter remind us contemporary bakers that old advice is still good advice, such as the recommendation to sprinkle a sugar-flour blend across an unbaked pie crust to prevent a soggy bottom once baked. Sheehan’s devoted work, pulling treasures out of these faded and discarded booklets, has brought new life to recipes that deserve a spotlight in this century. 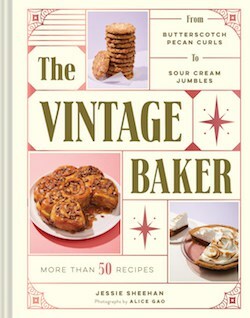 The Vintage Baker is already a timeless addition to my cookbook collection, and a new classic in its own right. 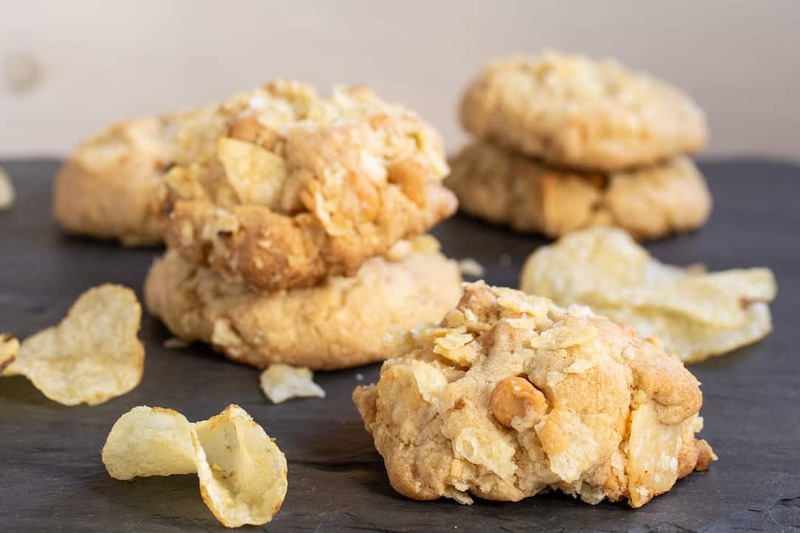 The Vintage Baker, a cookbook by Jessie Sheehan, lovingly updates recipes from midcentury vintage recipe booklets for the 21st century - like this cookie recipe for Butterscotch Potato Chip Balls. Preheat the oven to 350 degrees F (180 degrees C). Line a rimmed baking sheet with parchment paper. In a medium bowl, combine the flour, baking soda, and salt and whisk together. Add the butterscotch chips and set aside. In the bowl of a stand mixer fitted with the paddle attachment, cream the melted butter and sugars on medium-high speed until thick, light, and glossy, 3 to 5 minutes, scraping the bowl with a rubber spatula as needed. Decrease the mixer speed to medium-low and add the egg and yolk, one at a time, beating well and scraping the bowl after each addition with a rubber spatula. Add the vanilla and mix to combine. Add the dry ingredients all at once, mixing just to combine. 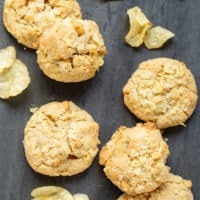 Remove the bowl from the stand mixer and add 3 cups (105 grams) of the potato chips to the dough, combining and crushing the chips with a rubber spatula. In a small bowl, crush the remaining 2 cups (70 grams) potato chips. Scoop the dough into 1 1/2-tablespoon balls with a cookie scoop or measuring spoon, rolling each ball in the leftover crushed chips, and evenly place 12 on the prepared baking sheet. Sprinkle each cookie with flaky sea salt, and bake for 8 to 10 minutes, rotating at the halfway point, until lightly browned. Remove from the oven and press down on each cookie with a spatula to slightly flatten. Repeat with the remaining cookie dough. Let cool briefly and serve warm, because who doesn't love a cookie warm from the oven? The cookies will keep in an airtight container on the counter for up to 3 days.